A biography of a great lama is called a “namtar” (rnam-thar), a liberating biography, since it inspires the listeners to follow the example of the lama and achieve liberation and enlightenment. The biography of Tsongkhapa (rJe Tsong-kha-pa Blo-bzang grags-pa) (1357-1419) is indeed inspiring. Tsongkhapa was born in Tsongkha (Tsong-kha), Amdo, in 1357. Both Buddha Shakyamuni and Guru Rinpoche prophesied Tsongkhapa’s birth and attainments. A young boy, who was a previous incarnation of Tsongkhapa, presented a crystal rosary to Buddha Shakyamuni, and in return, received a conch shell. 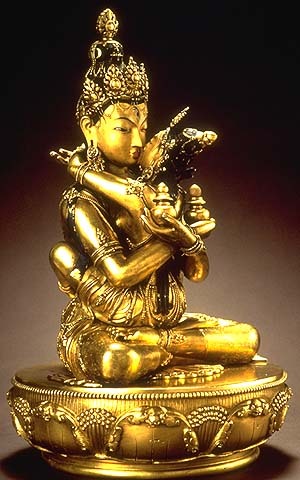 Buddha prophesied that Manjushri would be born as a boy in Tibet, would establish Ganden monastery, and would present a crown to his statue.Buddha named the boy Sumati-kirti (Blo-bzang grags-pa, Lozang-dragpa). Guru Rinpoche also prophesied that a monk named Lozang-dragpa would be born near China, that he would be regarded as an emanation of a great bodhisattva, and that he would make a Buddha-statue into a Sambhogakaya representation. 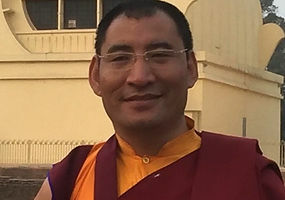 Soon after taking lay vows at the age of three, Tsongkapha’s father invited lama Chojey Dondrub-rinchen to their home, and the lama offered to care for Tsongkapha’s education. He studied with Chojey Dondrub-rinchen, and Chojey Dondrub-rinchen gave him the empowerments of Five-Deity Chakrasamvara (Dril-bu lha-lnga), Hevajra, Yamantaka, and Vajrapani. 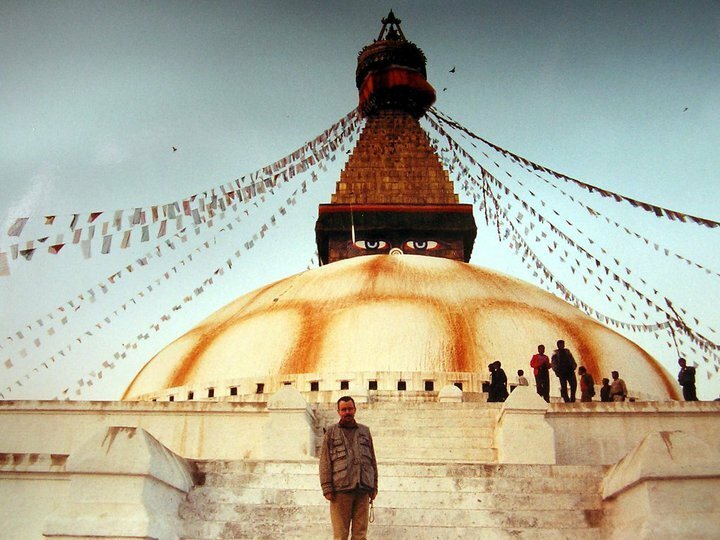 By the age of seven, he had memorized their complete rituals, had completed the Chakrasamvara retreat, was doing the self-initiation, and had a vision of Vajrapani. He frequently dreamt of Atisha (Jo-bo rJe dPal-ldan A-ti-sha) (982-1054), which was a sign that he would correct the misunderstanding of the Dharma (combining sutra and tantra) and would restore the Dharma’s purity in Tibet just as Atisha had done. Tsongkhapa received novice vows at the age of seven and was given the ordination name Lozang-dragpa. He continued to study in Amdo with this lama until he was sixteen and then went to U-tsang (dBus-gtsang, Central Tibet) to continue his studies. He never returned to his Amdo. In Central Tibet, Tsongkhapa first studied at a Drigung Kagyu monastery, where he learned the Drigung mahamudra tradition called “possessing five” (phyag-chen lnga-ldan), medicine, and further details about bodhichitta. By seventeen, he was a skilled doctor, and by nineteen, he was already acknowledged as a great scholar. He traveled to the most famous monasteries of the Tibetan Buddhist traditions. He received the Kadam lam-rim (lam-rim, graded sutra path) teachings and also innumerable tantric empowerments and teachings, including the Sakya tradition of lamdray (lam-‘bras, the paths and the result), the Drigung Kagyu tradition of the six teachings of Naropa (Na-ro’i chos-drug, six yogas of Naropa), and Kalachakra. He also studied poetic composition, astrology, and mandala construction. In all his studies, he only had to hear an explanation once and then he understood and remembered it perfectly. 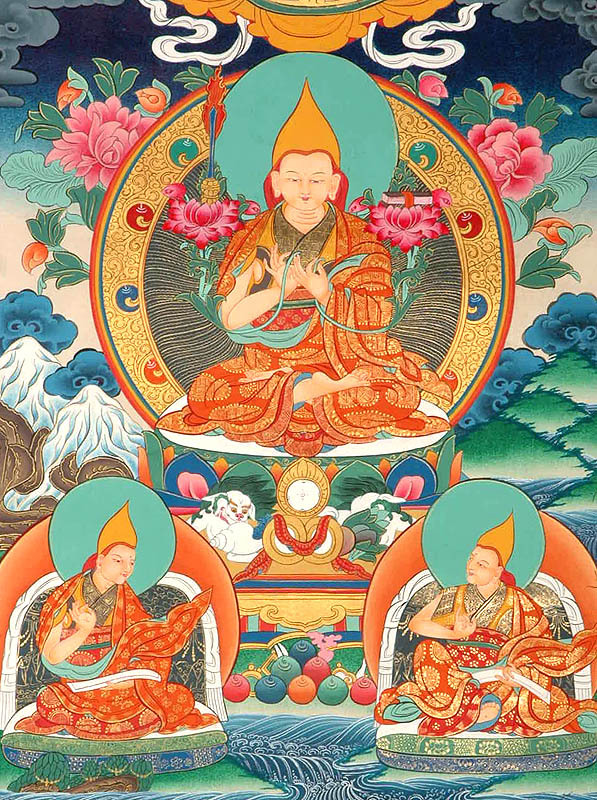 Tsongkhapa studied the practice of Manjushri Dharmachakra (‘Jam-dbyangs chos- kyi ‘khor-lo) and Madhyamaka with the Karma Kagyu Lama Umapa (Bla-ma dbu-ma-pa dPa’-bo rdo-rje). This great master had studied Madhyamaka with the Sakya tradition and, since childhood, had daily visions of Manjushri, who taught him one verse each day. He and Tsongkhapa became mutual teacher and disciple – so much so that Lama Umapa checked with Tsongkhapa to get confirmation that the teachings he received in his visions of Manjushri were correct. Together with Lama Umapa, Tsongkhapa did an extensive retreat on Manjushri, and from that time onward, Tsongkhapa received direct instruction from Manjushri and was able to receive from him answers to all his questions in pure visions. In order to have a proper understanding of Madhyamaka and Guhyasamaja. Manjushri advised Tsongkhapa to do a very long retreat. After a four-year retreat, aimed at acquiring a proper understanding of Madhyamaka and Guhyasamaja, Tsongkhapa had a vision of Maitreya. As a result he traveled to Lhasa where he and his disciples restored the great Maitreya statue.This was the first of his four major deeds. Tsongkhapa then did an extensive retreat on the Kalachakra complete stage, and after that, a one-year retreat on Madhyamaka. Although Tsongkhapa had learned much about Madhyamaka and voidness from his teachers, he had never felt satisfied with the level of explanation. Before entering this one-year retreat, Manjushri advised him to rely on the Madhyamaka commentary by Buddhapalita (Sangs-rgyas bskyangs). Tsongkhapa did and, consequently during the retreat, gained full nonconceptual cognition of voidness. Based on his realization, Tsongkhapa revised completely the understanding of the Prasangika Madhyamaka teachings on voidness and related topics that the teachers and learned masters of his day had held. In this regard, he was a radical reformer with the courage to go beyond current beliefs when he found them inadequate. In 1409, at the age of 52, he inaugurated the Monlam Great Prayer Festival (sMon-lam chen-mo) at the Lhasa Jokang (Jo-khang). He offered a gold crown to the Shakyamuni statue, signifying that it was now a Sambhogakaya statue, not just Nirmanakaya. (The Sambhogakaya forms of Buddhas live until all beings are liberated from samsara, whereas Nirmanakaya forms live only a short time.) This is considered his third great deed. After this, his disciples asked him to stop traveling so much and they founded Ganden Monastery (dGa’-ldan dGon-pa) for him. At Ganden, Tsongkhapa continued to teach, write (especially on Chakrasamvara), and do retreats. He commissioned the building of the great Ganden hall with a huge Buddha statue and copper three-dimensional mandalas of Guhyasamaja, Chakrasamvara, and Yamantaka. This is considered his fourth great deed. He continued his writing and in the end, his collected works totaled eighteen volumes, with the largest amount being on Guhyasamaja. Tsongkhapa died at Ganden in 1419, at the age of 62. He attained enlightenment after his death by achieving an illusory body (sgyu-lus) instead of bardo. This was to emphasize the need for monks to follow strict celibacy, since enlightenment in this lifetime requires practice with a consort at least once. Before he passed away, Tsongkhapa gave his hat and robe to Gyeltsabjey (rGyal- tshab rJe Dar-ma rin-chen) (1364-1432), who held the Ganden throne for twelve years. This began the tradition of the Ganden Throne Holder (dGa’-ldan khri-pa, Ganden Tripa) being the head of the Gelug order. The next throne holder was Kaydrubjey (mKhas-grub rJe dGe-! legs dpal-bzang) (1385-1438), who later had five visions of Tsongkhapa, clarifying his doubts and answering his questions. The Gelug lineage has flourished ever since.